Spring is the season of resurrection, but some signs of spring in the world around us culminate in disastrous outcomes that fail to reveal what we expect of Easter. The last two years brought three failed birds’ nests to our yard. In 2014 a pair of mourning doves built a nest in our front eaves, but the nest slid off its perch and we found it on the ground one morning. Soon after that failure, cardinals constructed a nest in a low shrub outside the sunroom window where we could observe undetected, but one morning we discovered the eggs missing from the nest. Alerted to the fact that one of the eggs did not match the rest, I learned that cowbirds steal space for their eggs in other species’ nests. Our cardinal family had, indeed, been victimized by a cowbird. We were advised to remove the cowbird egg from the nest. One internet source I read indicated that “cowbirds may ‘punish’ egg-rejectors by destroying the eggs or entire nest.” Did our intrusion lead to the eventual nest failure? 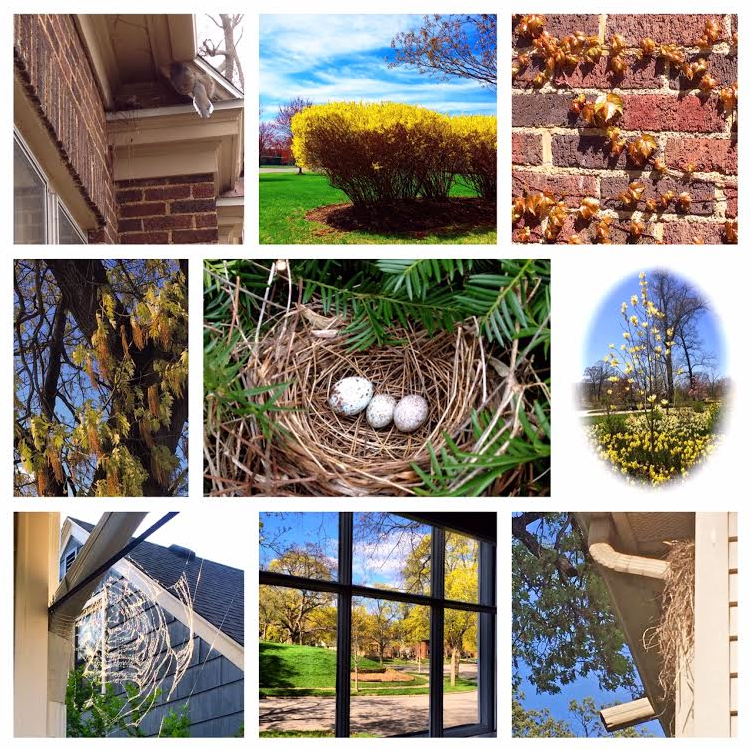 With our grim 2014 history, I was elated last spring to discover that a robin had built a sloppy nest in a small niche created by our backyard guttering at the second-story level. By the time I noticed the nest, the mother bird was already sitting on it, and, though I had missed the building frenzy, I felt hopeful that this nest might survive long enough to produce young robins. Only two days into nest-watching, however, I was disappointed yet again one morning to find this third nest on the ground with no sign of eggs anywhere. Perhaps they were yet to be laid or maybe a raccoon got to them, a friend suggested. Typically the season bounces back and forth between winter and summer with at least a few casualties as chilly temperatures and late snow showers snuff out magnolia blossoms or fruit tree buds perhaps forced out prematurely by too-warm-too-soon temps. Last year I found our tender new greenery chomped to the ground or stomped to bits overnight by hungry intruders. Caught in the midst of these kinds of seasonal “failures” and losses or severe weather in our own lives, how do we respond when resurrection seems momentarily to slip out of sight? What learnings might take place even in the midst of disappointment? Along with the disappointments of spring, we savor earlier sunrises and longer evenings, the reappearance of morning birdsong, the variety of growing things that come to life in our yards and flower beds, the successful nest-building, and the many creatures that reappear from their winter hiding places. What will the fullness of living into Easter look like in each of our lives this resurrection season? In the words of Jan Richardson, what are we being asked “to carry from the Easter garden to proclaim in the world, in the way that only we can proclaim it and live it out?” Where will the Easter path take us?